St. Patrick is the Emerald Isle’s patron saint. Ireland is predominantly Catholic, & St. Patrick himself is largely responsible for that. His missionary work in Ireland in the 400’s A. D. laid the groundwork for not only Ireland’s conversion to Christianity, but also, through his spiritual descendants, for the Catholicism of much of Europe. 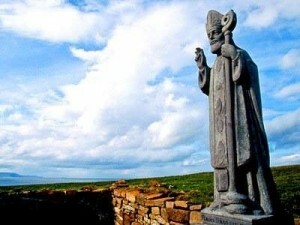 The monasteries founded by St. Patrick & his followers were repositories for history, mathematics, philosophy, astronomy, and higher learning in general, educating the elite of Europe for generations. The monasteries established by St. Patrick extended from one end of Eire to the other. In many areas, these monasteries were the first settlements & became the center of the communities that grew around them. Some have made the bold statement that the Irish saved civilization itself. Thanks to the work begun by St. Patrick & his disciples, that is no idle boast.